"These people are unarmed," Captain Darius complained, watching the Simps below. "They can barely walk straight. How are they a threat?" Bryce held the car steady over the city wall, ten feet above the crowd of staggering, grinning invaders. "Haven't you seen ' Night of the Living Dead '? They're like zombies." "Zombies are fairy tales," Darius said. "And these people aren't walking dead. They look healthy." Ruby sat in the back seat, leaning over the side, staring down at the strange invaders. Many of them gazed up with expressions of empty glee. "That woman there is missing an ear," Bryce observed, pointing. "Most of them have dried blood on them, probably from where they got bit." "I'm not saying they aren't dangerous," Darius said. "It's clear that something unnatural is happening here, but we don't know what we're dealing with." "First, I'd like to get an idea of their numbers. Fly over them and let's take a look." Bryce eased the car forward. The simps staggered along the road as far back as they could see, gathering to cross the bridge. Some waded through the river around the city. Ruby noticed a few bodies floating lifelessly with the current. They'd gathered around the city walls, packed around the western gate, their hands waving through the bars. 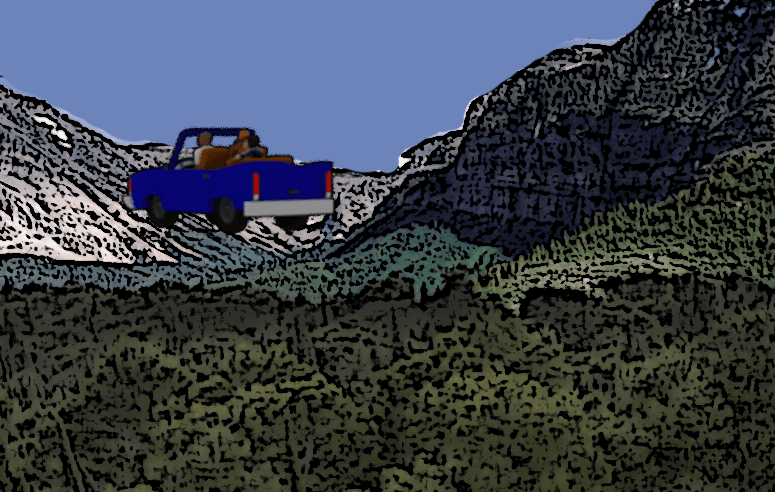 As Bryce eased the car away from the city, the line of bodies extended on. The woods were full of them, all heading towards Cavaheim in their slow, staggering gait. Most of them were human, but some appeared to be alien, gray skins like the Vayna, some human animal hybrids—furry faced people and reptilian monsters. A few lay in a clearing, possibly dead. "My God, there's thousands of them," Darius said. "What's driving them? What do they want?" "We talked to one on our way to the city," Bryce said. "She didn't seem to want anything. She was just... happy. It's creepy." "We need to interrogate one, bring them into the city and tie them down. We can get them to talk." "That's a bad idea," Ruby said. "I don't think you want to go anywhere near them." "I don't know if you've noticed," Darius said, "But my city is under siege. We don't know what the enemy wants. For all we know, they're hungry refugees." "Hungry for brains," Bryce muttered. "Take me back to the gate," Darius ordered. Bryce turned the car. Back at the wall, the Simps were spreading out, wandering along the walls, looking for a way in. "Does this wall extend all the way around the city?" Bryce asked. "It reaches cliff-faces on both sides. No army could attack us from the mountain side." "No army," Ruby said. "But could one or two of those people down there climb around and get in?" Darius frowned. "One or two wouldn't be a threat." Beyond the city gate, soldiers lined up, facing the crowd of invaders through the bars, spears held ready. Bryce set the car down behind them. Darius leapt out and marched towards the gate. "Be careful, sir," a soldier said. "They bite." Darius spun to face him. "What do you mean? Have they bitten anyone?" "Just one man, but it wasn't too bad. Only a scratch." The captain's face darkened. "Where is he now?" "He was acting strange. They took him to the infirmary." Darius exchanged a look with Ruby and Bryce. He turned and faced the crowd beyond the gate. 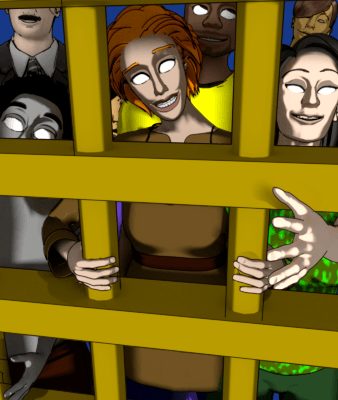 The simps leaned against the bars, reaching in, grinning with hysterical joy. Darius approached them. Ruby and Bryce followed but kept their distance. "Oh, crap," Bryce said. "That's Jane." Ruby followed his gaze. A woman in coarse leather pressed up against the gate. She might have been beautiful if it weren't for the vacant grin and the bloody drool running down her chin. Ruby had seen her before. She'd been crying over the body of her dead friend in the prison, and later, she'd been on the tower, ready to kill Eddie and anyone else responsible for the death of her beloved. Now she was a mindless clown, straining to reach through the bars. Ruby moved to stand beside the captain. "That was an acquaintance of my friend," she said, pointing. "She was in the city last night, but she left right after Jarrock died. She was normal. But now look at her." Darius frowned at the woman. He moved closer, just out of her reach. "What do you want?" Jane's smile broadened. "I want nothing," she said in a clear, coherent voice that didn't match the madness on her face. "I am content to bask in the beautiful sun and be alive." "Why are you here? Why are you attacking my city?" "We don't attack. We share. We want to share the light we've found with everyone. The world will be filled with light, and everyone will share in the blessings of ecstasy." Darius scowled. "We don't want to share." Jane's smile didn't diminish, but she groaned—a hollow, hungry sound. "You will understand soon. You will know the glory. Our joy is not complete until everyone shares it." "Well, you can go somewhere else to—"
A body fell from the top of the wall, directly on Darius's head. He crumbled under the weight. More bodies fell. All of them Simps. Some of them lay lifeless. Others climbed to their feet and shuffled towards the soldiers. The soldiers advanced, their spears thrust forward, and a few Simps were impaled. One soldier hesitated, perhaps unwilling to attack an unarmed woman. She approached, smiling and said, "Don't worry." When she was close enough, she lunged, grabbed his hand and bit it hard. The soldier screamed. "We're out of here," Bryce said, turning. "I... I can't leave them." "You can't fight. You can't get near them. There's too many." "I was supposed to help this city. Hera said—"
"We can't beat this. Eddie was right. We've got to go." Several of the soldiers were already bitten. One approached Ruby, grinning. The weight of the crowd outside pressed in on the gate. It bowed inward. A Simp boy slipped in through the bars. Ruby ran. Bryce was already in the car with the engine roaring. Ruby dove into the front seat. Bryce yanked back on the wheel and took off. Ruby sat up. "Hera. We have to save Hera. And Farook, and..." She fought back a sob. "I can't believe this is happening." As they soared over the city, they found that the Simps were already inside. Former Cavaheim citizens wandered the streets, biting their neighbors. Ruby stared down in horror. A boy watched as they passed overhead, running from a line of staggering Simps. He ran into a man staggering in the opposite direction who caught him. Ruby stifled a scream. "Goddamn," Bryce said as he rounded the granite building where they'd left Hera and Farook. "They work fast. We can't land here." Soldiers pulled off their helmets and smiled up at the flying car. Some marched through the huge open archway. "Drop me off on the roof," Ruby suggested. "There's no way," Bryce said. "You go down there, you're dead." "I have to do something." "Don't you get it? They've taken this whole city in less than five minutes. How long do you think you'd last if you were down there?" "But we have to save someone. Just one person. Let me find Hera." Bryce groaned. "This is such a bad idea." He eased the wheel forward. The car descended until they were level with an upper window. "We'll take a look before you go climbing in there." They hovered a few feet from the window. Ruby climbed out of her seat, preparing to jump in. She crouched, peering into the shadows beyond the window. There was a flash of movement within. A body lurched out, a soldier, his face insane with glee. He caught Ruby by the wrist before gravity drew him down. The sudden weight nearly yanked Ruby out of the car. Bryce caught her by the leg as she slid over the top of the door. Ruby hung, staring down at the soldier who stared back with his unflinching grin. "Come to the light," he said. "No, but he's not going to let go." The grip did not loosen. He began pulling himself up, his mouth open, his eyes on Ruby's wrist. The soldier's eyes grew wide as his body jerked. Ruby didn't understand until she saw the spear protruding from the back of the soldier's neck. He jerked again, then released Ruby and fell away. Ruby looked up in time to see Hera, her face stunned, the spear sliding out of her hands as the soldier fell. A moment later, a man caught her around the waist and dragged her back to the shadows. Ruby, still hanging out of the car, reached for her. "Hera!" Bryce yanked back on Ruby's leg, tugging her inside. The moment she was in, he banked away from the building and took off. "No, go back," Ruby cried. "You can't. You go back there, you're one of them." Ruby clung to her door, staring down at the city. So many people, and all of them now gazed up at her, smiling. She slumped in her seat, her hands balled into fists, and cried.